Outreach Advertising Managing Director Sunit Jain with Axis Bank MD Shikha Sharma. 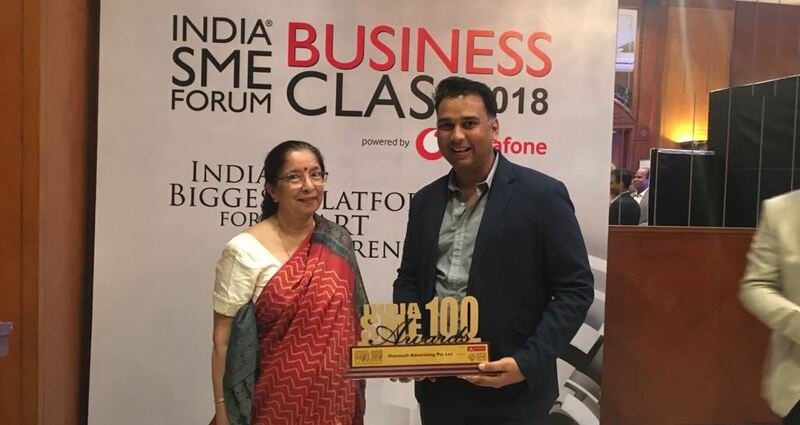 Guwahati based Out of Home (OoH) media firm Outreach Advertising has been recognised in the list of top 100 Small & Medium Enterprises (SMEs) in India for 2017, beating stiff competition from more than 33,000 vibrant enterprises from across the country, a statement said. The initiative by India SME Forum is organised in association with the Union Ministry of Micro, Small & Medium Enterprises. The awards were presented at New Delhi on August 9. The India SME 100 Awards is reputed as one of the largest gatherings of SMEs from India, drawing business owners, startup founders and investors from across the country. The selection process to pick the top 100 emerging SMEs involved a qualified and eminent jury’s assessments. Criteria considered in selecting the top SMEs included innovation, scalability, business feasibility, market opportunity, reach and revenue, the statement added. “More so, we have established business processes which is robust and systematic and has helped us got this recognition because most of small and medium enterprises don’t follow organised work processes,” he added. Sunit feels that such awards are a confidence booster for the entire services sector as most of the other winners were from manufacturing sector. “A lot of investors and bankers present at the event were amazed to see advertising & media enterprise getting an award and it would perhaps change their outlook on the fast evolving OOH space,” he said. Sunit said Outreach Advertising is the only enterprise amongst India’s Top 100 SMEs from the advertising & media sector in India and only one from Northeast India. The award was presented by Minister of State (Independent Charge) of Micro, Small & Medium Enterprises, Giriraj Singh, and former Union Minister of MSME, Kalraj Mishra.